Writer Agnes Grunwald-Spier '66 visited the Headington Campus for the first time after graduating from the Oxford College of Technology 48 years ago. 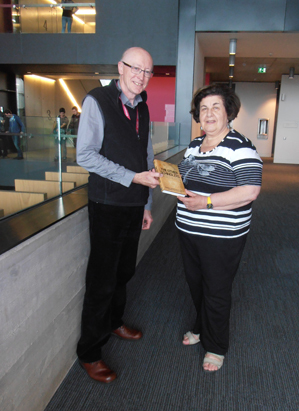 She kindly donated her book ‘The Other Schindlers’ to the JHBB library for our current students to enjoy. This first book was published in 2010 when she was 66. Agnes and her parents were persecuted as Jews in Budapest in the Holocaust. Her mother and baby Agnes, were saved from being deported to Auschwitz in 1944 by an unknown official. During her visit to Brookes she enjoyed looking around the new John Henry Brookes Building and eating lunch in the new Terrace restaurant. She reminisced about the old College days and the people she had met. Agnes was very complimentary about the new JHB Building saying how amazing the new campus was and how lucky the current students were to have such wonderful facilities.